Home / HEALTH / Archive by category "ERGONOMICS"
Are your losing hope to lose weight? Are you feeling depressed? Do you simply want to live healthy life? 1. You live longer using standing desk. This is horrible and shocking TRUTH, because most of us think that if we jog 30-50 min a day after work – we will be fine. an inactivity researcher at the Pennington Biomedical Research Center. 6 hours per day sitting for women increase the likelihood of dying by 37 percent (for men, it was 18 percent). The posture of sitting itself probably isn’t worse than any other type of daytime physical inactivity, like lying on the couch watching “Wheel of Fortune.” But for most of us, when we’re awake and not moving, we’re sitting. This is your body on chairs: Electrical activity in the muscles drops — “the muscles go as silent as those of a dead horse,” Hamilton says — leading to a cascade of harmful metabolic effects. Your calorie-burning rate immediately plunges to about one per minute, a third of what it would be if you got up and walked. Insulin effectiveness drops within a single day, and the risk of developing Type 2 diabetes rises. So does the risk of being obese. The enzymes responsible for breaking down lipids and triglycerides — for “vacuuming up fat out of the bloodstream,” as Hamilton puts it — plunge, which in turn causes the levels of good (HDL) cholesterol to fall. Working on a project at your standing desk keeps you focused on that one task you are working on right then and there. You are no longer distracted by multitasking which means you stay focused for longer. 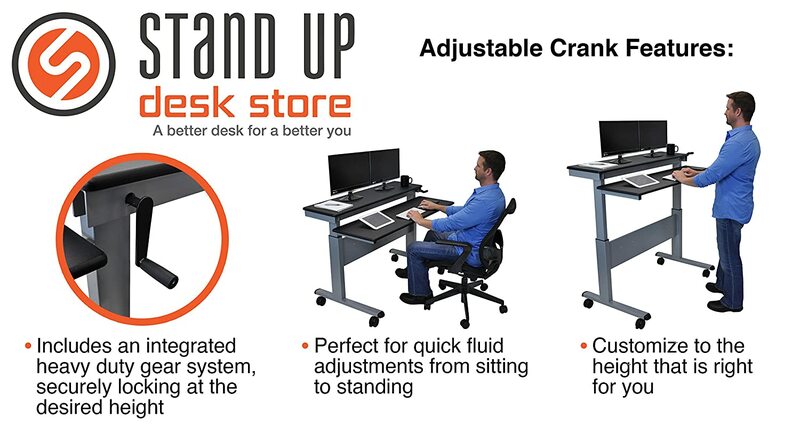 According to the team at the Draugiem Group Standing desks led to up to 10% more productivity. The reason was that when standing, there was that sense of urgency to get the task done. Standing also led to higher energy levels so the nonproductive midafternoon slump didn’t arrive. 5. Your metabolism increases and you lose weight. You burn less calories per year than a person did 50 years ago. When you sit at your computer, your calorie burn slows to 1 calorie per minute. In the 1960’s nearly half of all jobs required physical activity, today its less than 20%. Today we have less physical jobs, more automation, and live life at a much busier pace. Going to the health club and working out for 45-60 minutes is not enough. We need to interject movement “throughout” the day to compensate for all those little movements that have slowly been eliminated from our daily routine. Standing causes to have a much higher heart rate (around 10 beats per minute higher), which adds up to burning about 50 calories more per hour versus sitting. Over a year, that adds up to about 30,000 more calories or 8 pounds of fat. If you want to put that into activity levels,” Dr Buckley says, “then that would be the equivalent of running about 10 marathons a year. Just by standing up three or four hours in your day at work. 6. You feel happy, lower your stress levels, decrease depression risk. Regular exercise is a key factor to staying healthy. Going to the gym is the right step but if you couple that with sitting all day, you may negate the benefits of all your hard work. Recent studies tell us that we need to extend physical activity beyond the gym to make a bigger impact in our life. Women who sat for more than 7 hours a day were found to have a 47 percent higher risk of depression than women who sat for 4 hours or less per day. Studies linking depression and psychological distress with sitting scream – just do not sit all day! 7. You are designing your health future. The human body is simply not designed to sit for many hours at a time. Spending all day with pressure on your spine can have long-term effects. Walking is when our spine is in “neutral”. Standing is the next best thing. “The most striking feature of prolonged sitting is the absence of skeletal muscle contractions, particularly in the very large muscles of the lower limbs,” says David W. Dunstan, a professor at the Baker IDI Heart and Diabetes Institute in Australia, senior author of the Australian study, and a pioneer in the study of sedentary behavior. When muscles don’t contract, they require less fuel, and the surplus, in the form of blood sugar, accumulates in the bloodstream, contributing to diabetes risk and other health concerns. The best solution is to mix up your day with sitting, standing and walk. 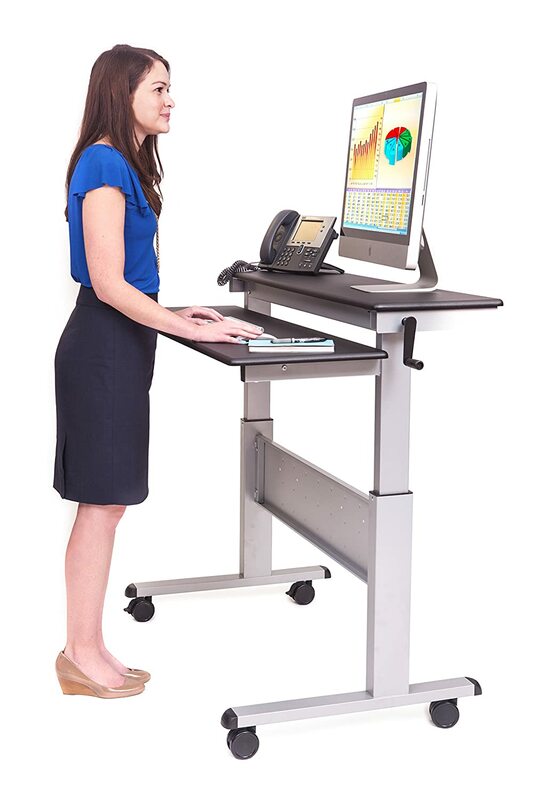 Standing desk that is multi functional allows you to do that. start healthy life without neck pain, risk of diseases and brain fog! Your best position for your health is your next position. For you overachievers who want to work while walking the next step up is to look at space saving treadmill with desk. Look at advice from athletes, office workers and Doctor! The following infographic is scary. It shows horrible side effects of sitting.